Did you know that birthstones are traditionally linked to the zodiac? Let’s find out how your horoscope can really work for you – in choosing the right birthstone for your zodiac sign! 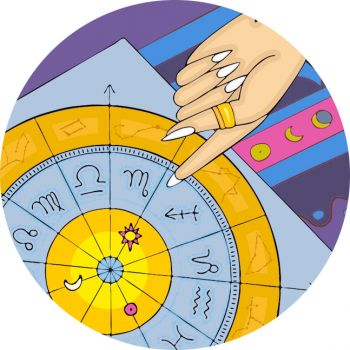 But did you know that each zodiac sign has several stones assigned to it for luck? The stone most recognised in association with Aries? Diamonds are always first choice for the first sign of the zodiac. Also for Aries: Bloodstone, Aquamarine, Topaz, Jasper and Sapphire. Read more about Aries style, here. Other stones include: Sapphire (a close second), Amber, Coral, Rose Quartz, Turquoise and also, Diamond. Read more about Taurus style, here. The stone of Gemini, the Twins? Alexandrite suits the Gemini spirit. She’s super expressive with her hands so needs something beautiful to adorn her fingers or wrists. They can also carry lots of glitz and glitter, so go all out! Also: Agate, Rock Crystal, Chrysoprase, Citrine, Moonstone, Pearl, White Sapphire, Emerald and Ruby. Read more about Gemini style, here. Ruby is the right choice for Cancer. I also love pearls for this zodiac sign, perhaps because they’re found in a shell, just like the cretaceous sign of Cancer the Crab. ThIS lustrous spherical jewel (and mother of pearl,) is reminiscent of the Cancer-ruled Moon too! These too: Emerald and Moonstone. Read more about Cancer style, here. Read more about Leo style, here. Strike the right chord with Virgo and choose the sister of Ruby – Sapphire. Deriving from the Greek name for blue, ‘sapphirus’, since ancient times it has held association with cosmic forces. In Sanskrit it is referred to as sauriatna, “Sacred to Saturn”. And the best of the rest for Virgo? Carnelian or Blue Sapphire, Sardonyx, Jade, Jasper, Moss Agate and Peridot. Read more about Virgo style, here. Tourmaline is known as ‘the muse’s stone’, as it’s said to stimulates the imagination. Libra likes Pink Tourmaline, which is sometimes called ‘rubellite’. It went out of fashion in 1912, when rumour had it that it was a particularly unlucky gemstone. Libra can also go for Peridot, Lapis Lazuli, Opal, Aquamarine and Sapphire. Read more about Libra style, here. Scorpio scores with citrine. Also known Yellow Topaz, it’s a crystalline quartz named after the lemon. According to South American shamans, citrine has the power to dissipate all negative energies, and diffuse man’s fears. Read more about Scorpio style, here. The word ‘Topaz’ is believed to have originated in the Sanskrit word for fire, ‘tapas’, so for Sagittarius, Blue Topaz is a choice gemstone. Not only is the sentiment perfect for a fire sign but Sagittarius also suits blues and purples – they’re their best shades! However, the blue colour comes from a treatment – the stones actually come out of the earth white. Sagittarius also suits: Amethyst, Ruby, Sapphire, Turquoise, Blue Topaz, Citrine and Ruby. Read more about Sagittarius style, here. As a Cardinal sign, Capricorn suits Garnet, which hails from Myanmar and Sri Lanka. This is a gemstone that was once used by crusaders to protect them from harm. They were also fashioned into bullets. This sign also suits: Ruby, Amethyst, Agate, Black Onyx and Blue Topaz. Read more about Capricorn style, here. The precious stone for Aquarius is Amethyst, the most popular crystalline quartz, believed to enhance the health and spiritual well-being of the wearer. Tibetans consider it sacred and make their rosary beads from Amethyst. This sign can also be linked to: Garnet, Moss Agate, Opal, Sugilite and magical Moonstone. Read more about Aquarius style, here. Pisces’ stone is Aquamarine, a variety of beryl that comes from Sri Lanka, Brazil, America and Madagascar. This star sign stone comes in a variety of shades of blue – from light and lovely to deep sea shades, simply perfect for our Pisces pals. They can also wear: Amethyst, Bloodstone, Jade, Rock Crystal and Sapphire, beautifully. Read more about Pisces style, here.